1. 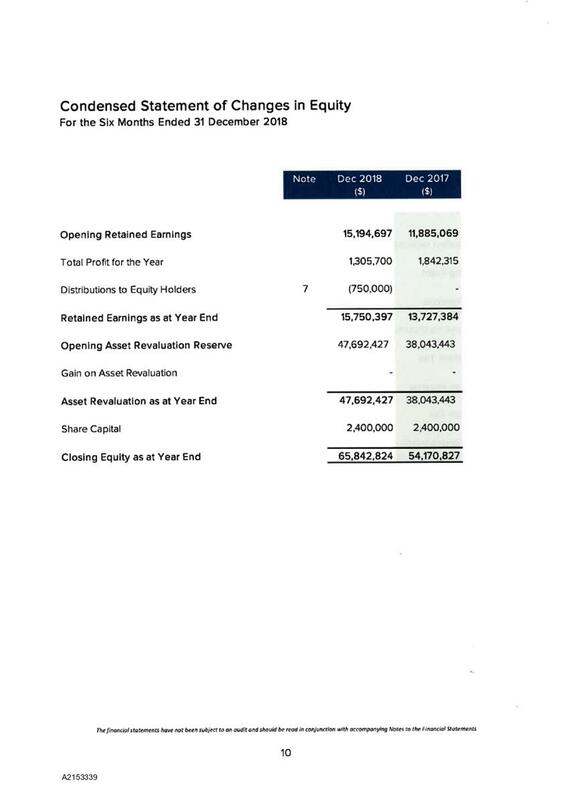 Confirms the minutes of the meeting of the Joint Shareholders Committee, held on 20 November 2018, as a true and correct record. 1. 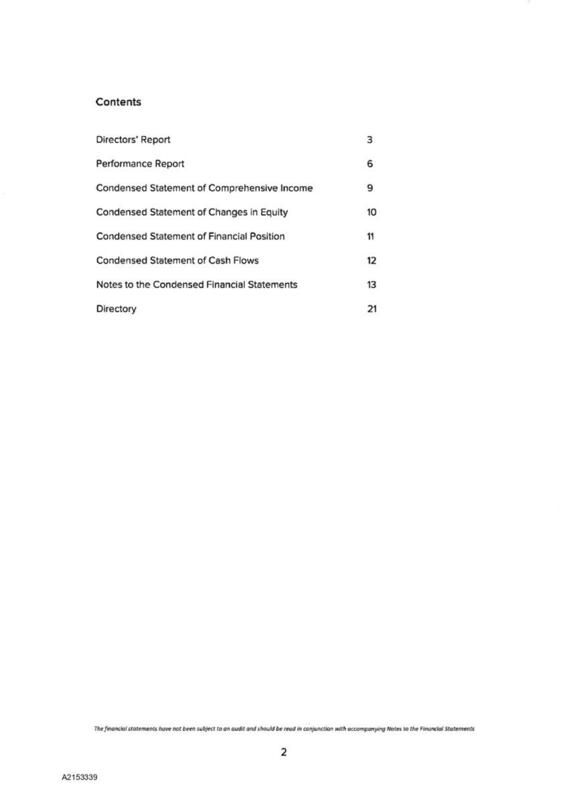 Receives the report Port Nelson Limited half yearly report to 31 December 2018 (R9955) and its attachment (A2143970). 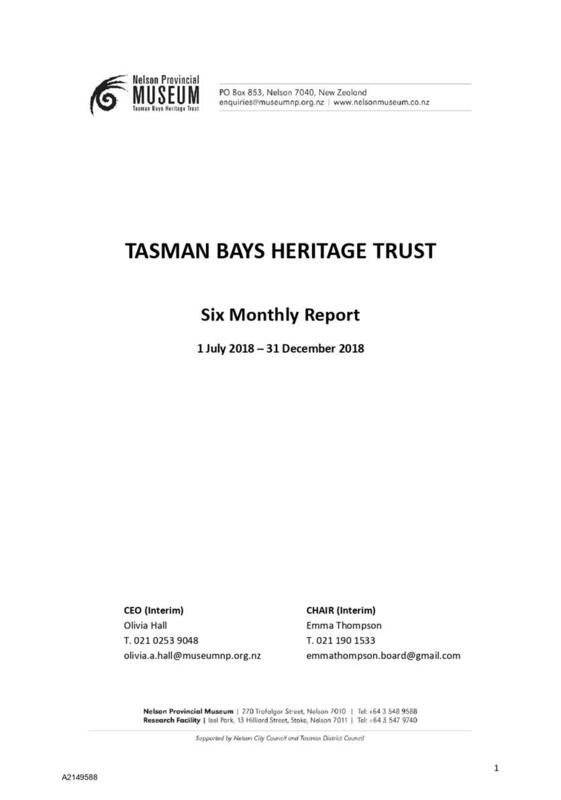 · Requests the Tasman Bays Heritage Trust to revise its visitation forecasts. 1. 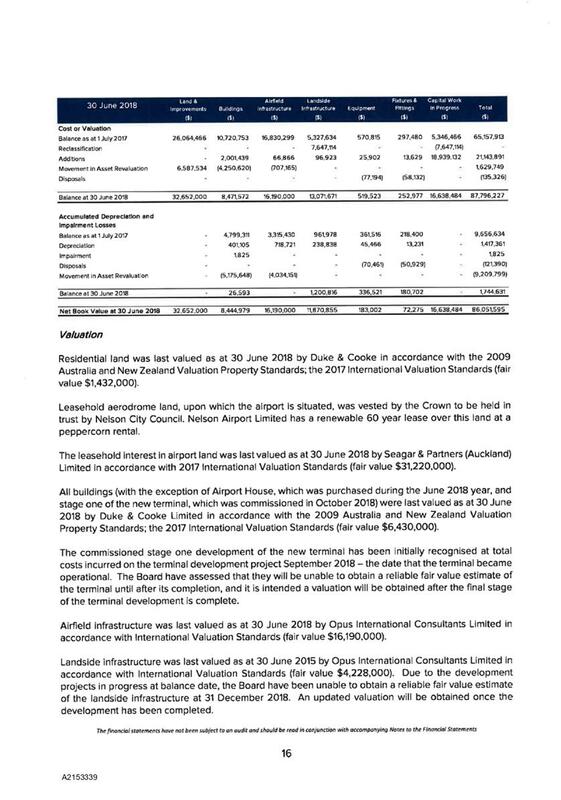 Receives the report (R10050) and its attachment (A2153339). 1. 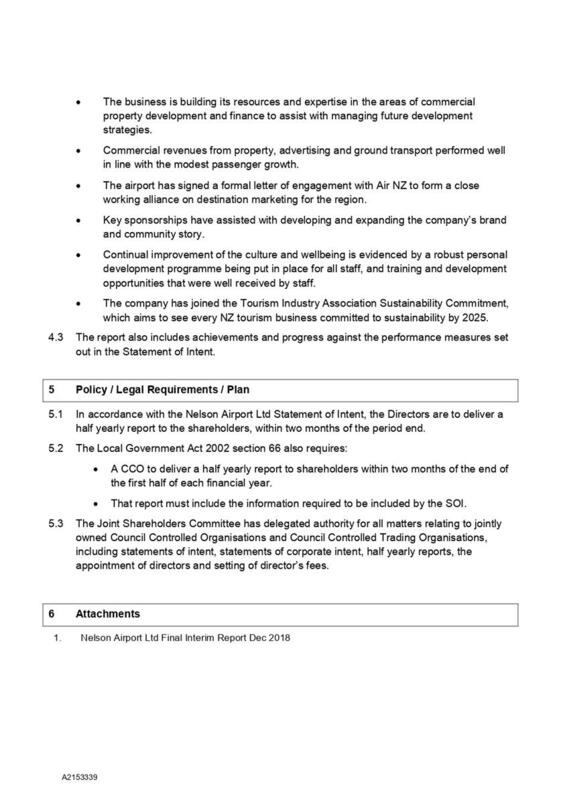 Confirms, in accordance with sections 48(5) and 48(6) of the Local Government Official Information and Meetings Act 1987, that Robert Evans, Chief Executive and Simon Orr, Corporate Services Manager, Nelson Airport Ltd, remain after the public has been excluded, for Item 1 of the Public Excluded agenda (Nelson Airport Limited - Draft Statement of Intent 2018-2019), as they have knowledge relating to Nelson Airport Ltd that will assist the meeting. 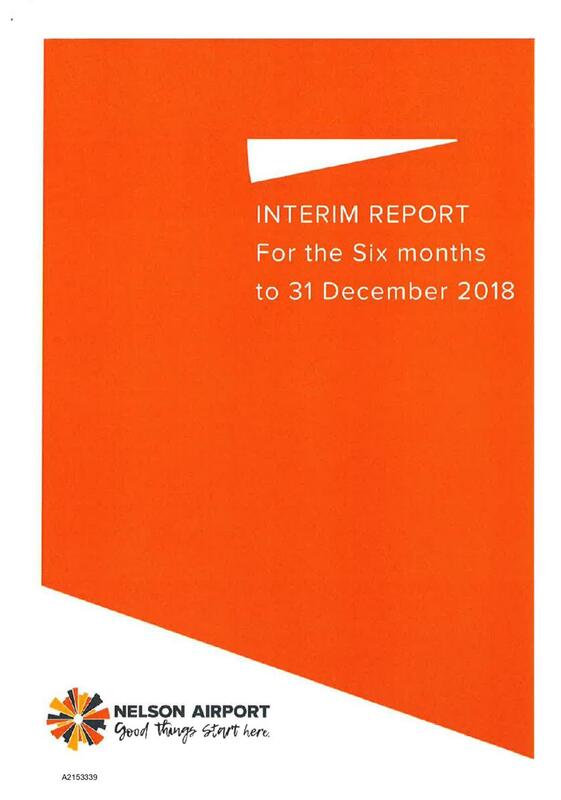 1.1 To receive the half yearly report to 31 December 2018 from Port Nelson Limited. 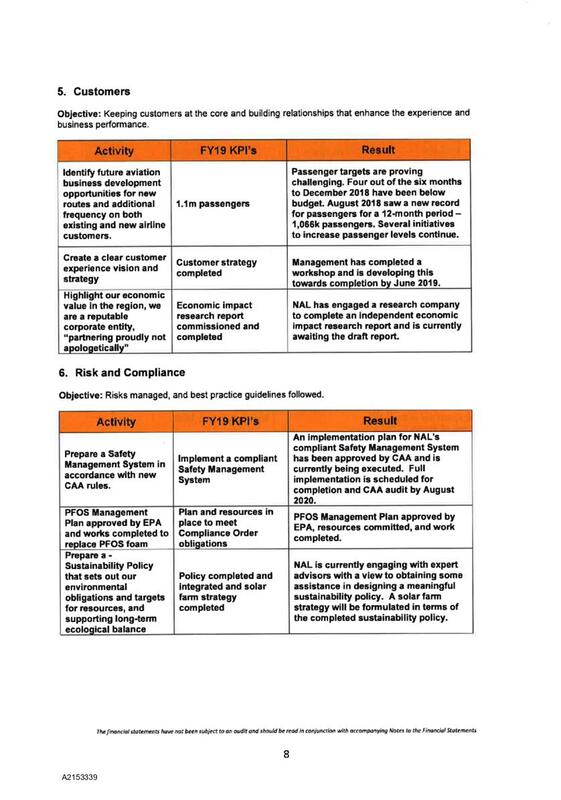 2.1 The Port Companies Act 1988 requires delivery of the half year report within two months of the end of the period to the shareholders and the Minister of Transport. This requirement has been met. 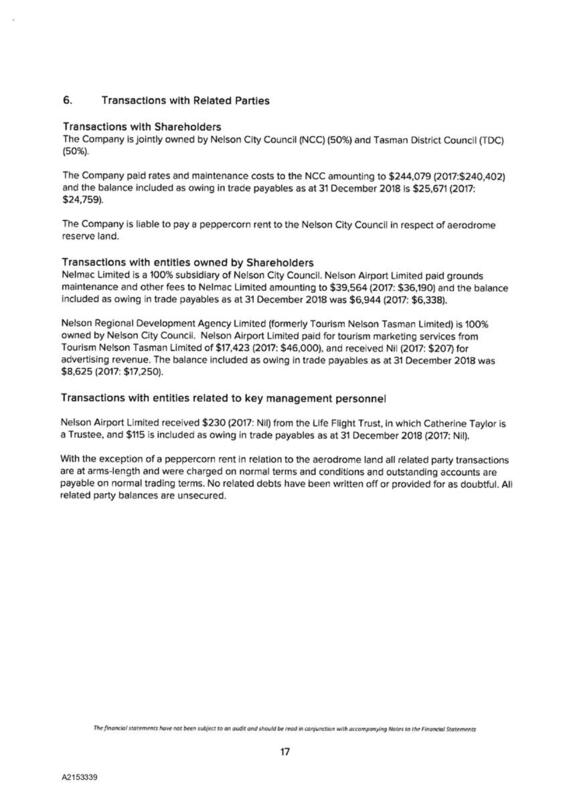 2.2 The Port Company presented on the six monthly result at the Joint Committee of Nelson City and Tasman District Council held on 26 March 2019 and are therefore not presenting again today. 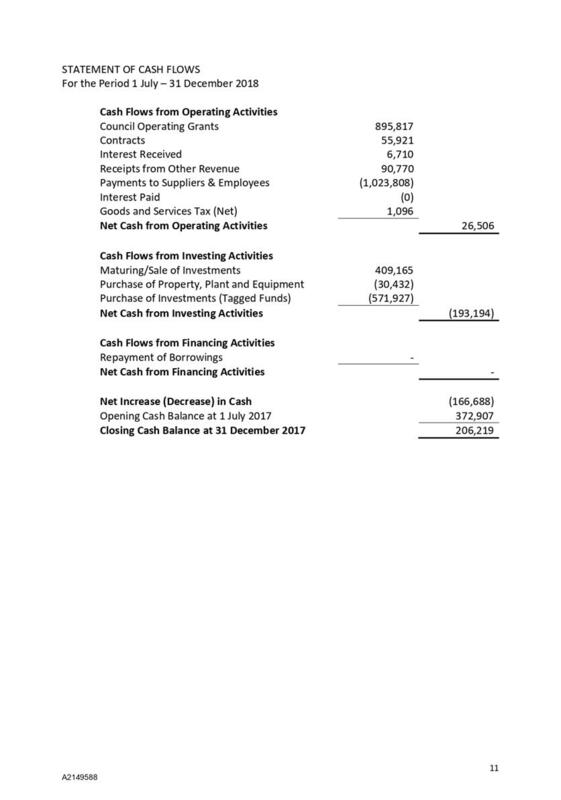 3.1 The half yearly report of Port Nelson for the period ending 31 December 2018 is included as Attachment 1. 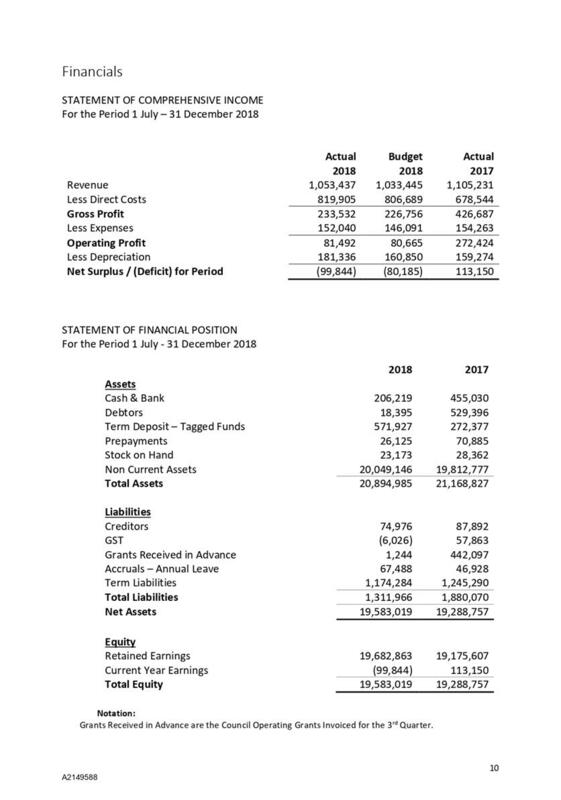 3.1.1 For the first six months of this financial year Port Nelson reported total revenue of $32.8 million, up 3% against budget and up 3.2% on the same period last year. 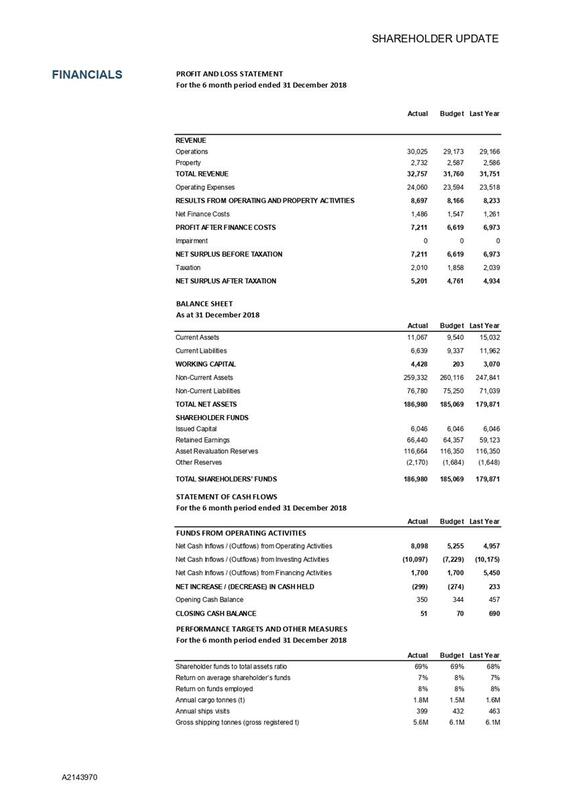 3.1.2 Cargo volumes for the first half of the year were ahead of budget with 1.831 million tonnes handled against the budget of 1.649 million, and up on the 1.631 million handled at the same time last year. 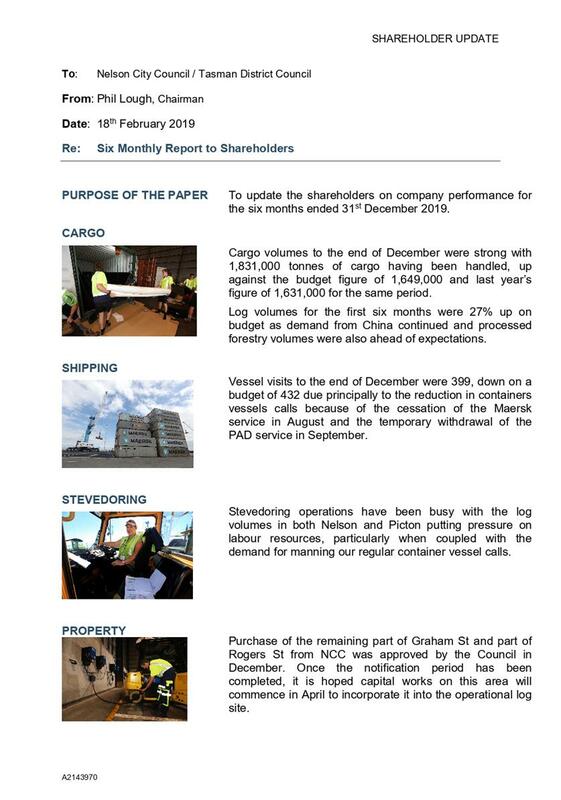 3.1.3 Vessel visits were 399, down on the budget of 432 due principally to the reduction in container vessels calls as a result of the cessation of the Maersk service in August and the temporary withdrawal of the PAD service in September. 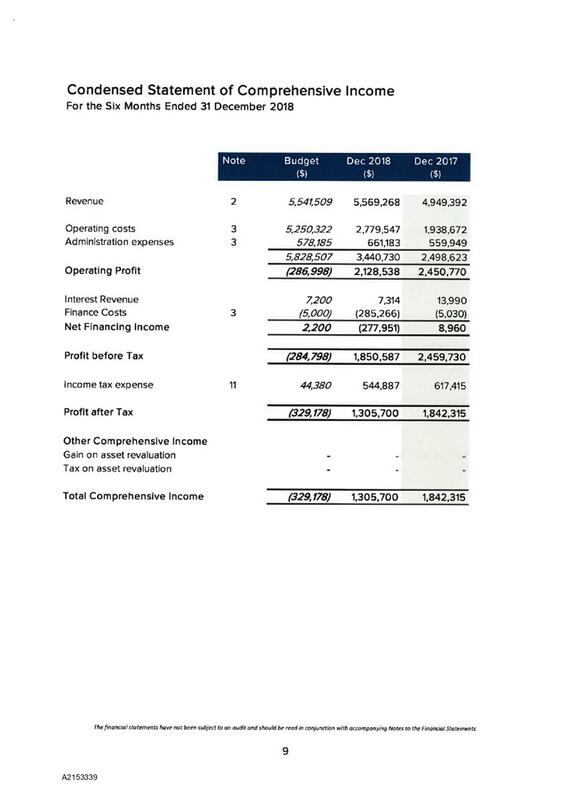 3.1.4 Net profit after tax (NPAT) of $5.2 million is 9.2% above budget and 5.4% higher than the same time last year. 3.2.2 Lost time injury (LTI) frequency rate of 2.9 versus a budget of less than 1.5 (higher than the same time last year of 2.3). 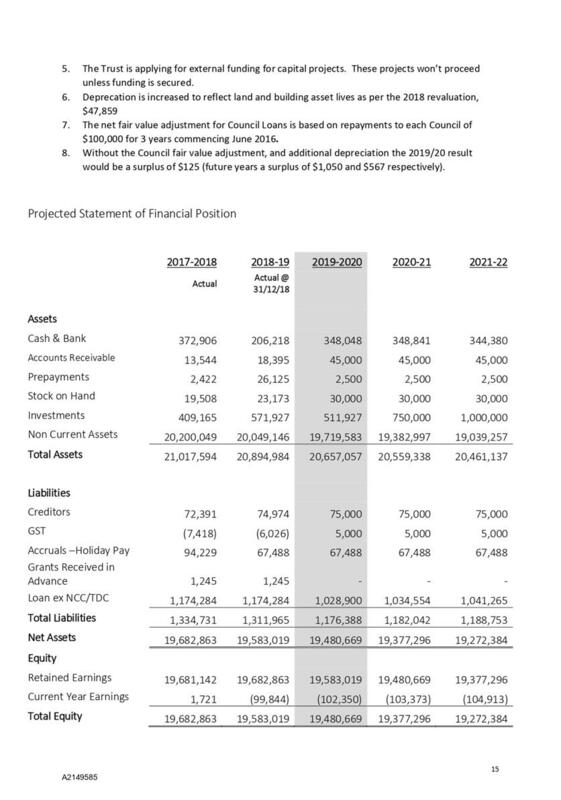 3.2.3 Capital expenditure programme (and therefore debt to equity ratio) is below budget by $6.5 million due to the timing variations. 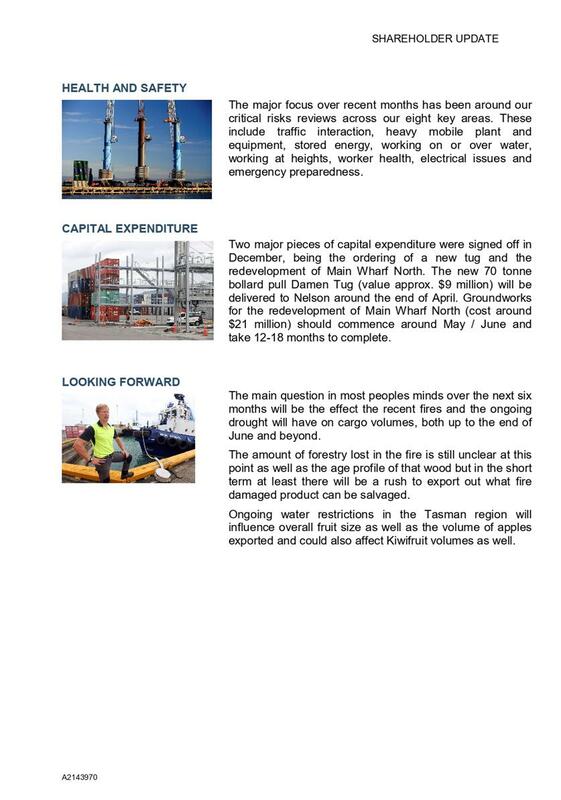 3.3 As commented on in the attached six monthly report, there is concern of the impact of the recent fires and the ongoing drought on cargo volumes through the Port over the short and medium term. 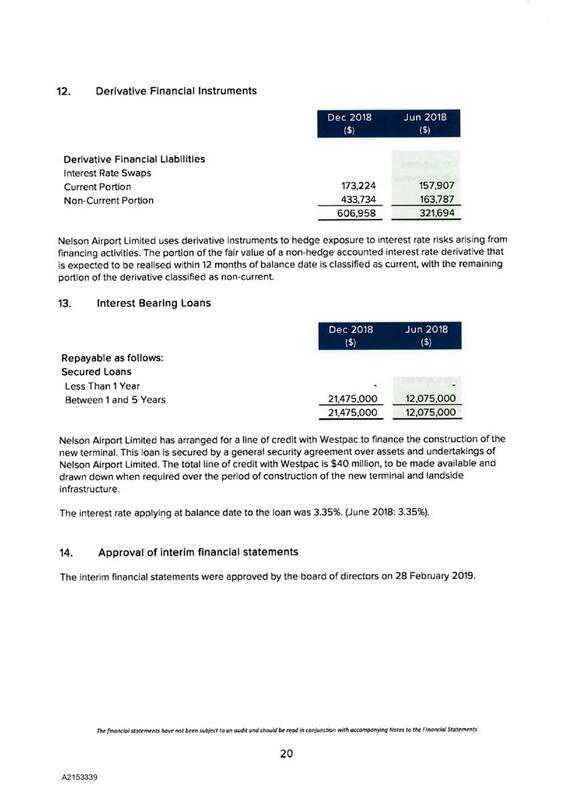 3.4 The Statement of Corporate Intent for Port Nelson Limited is not due to be received until 31 July 2019 and will be brought to the 20 August 2019 Joint Shareholders Committee meeting. 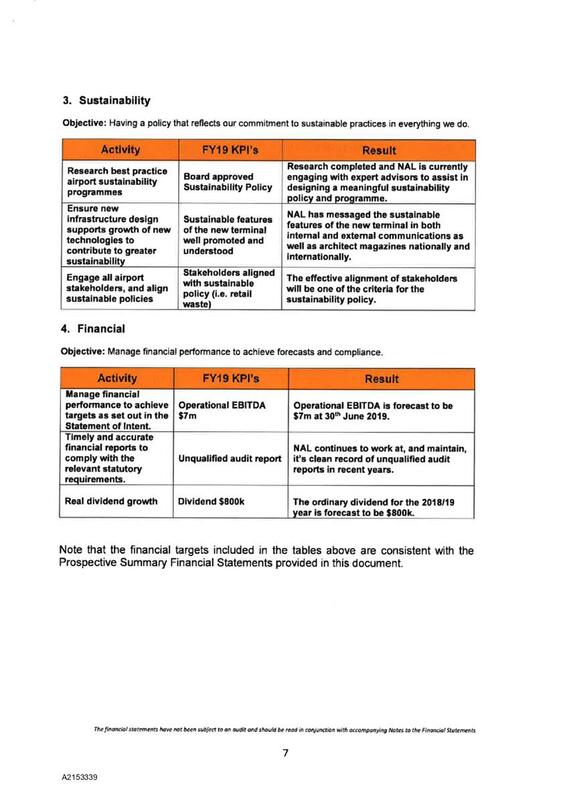 4.1 Port Nelson has complied with the Port Companies Act 1988 in preparing a half yearly report. 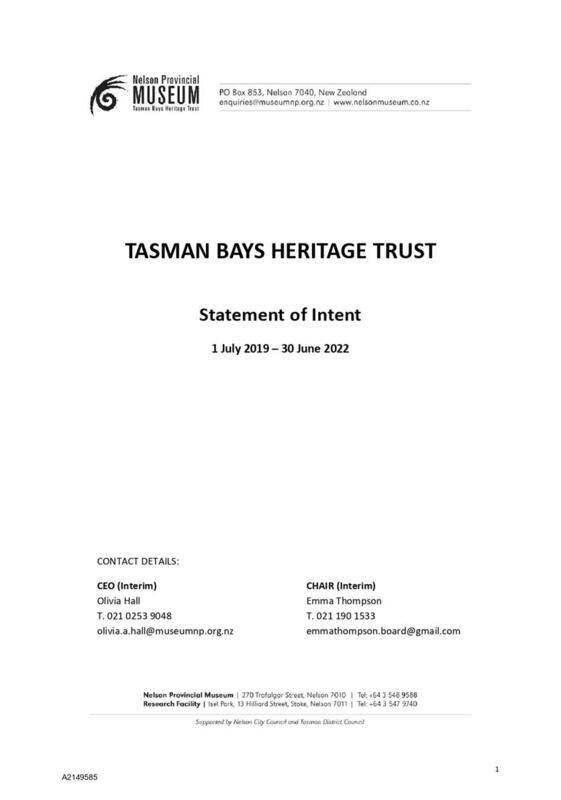 1.1 To receive the half yearly report from the Tasman Bays Heritage Trust (TBHT) (Attachment 1) and to consider the Trust’s draft Statement of Intent 2019/2022 (Attachment 2). 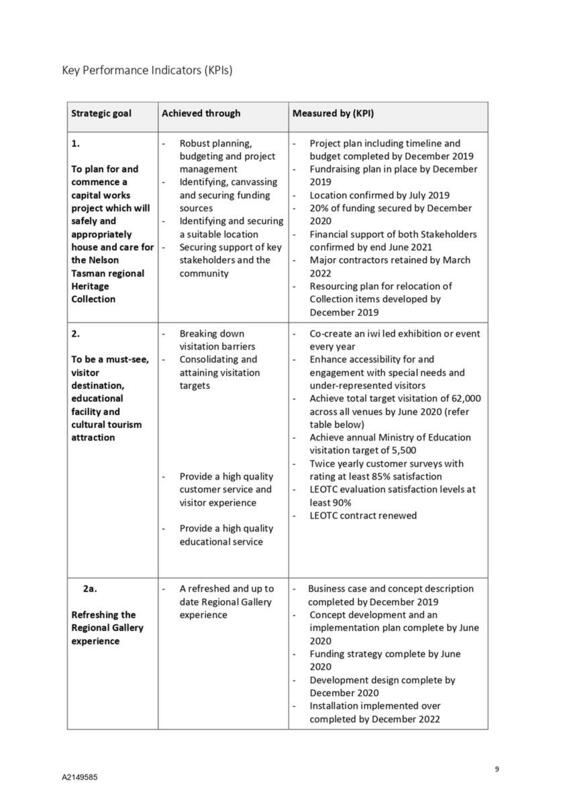 2.1 TBHT has delivered its six monthly report to December 2018 and a draft Statement of Intent, as required under the Local Government Act 2002. 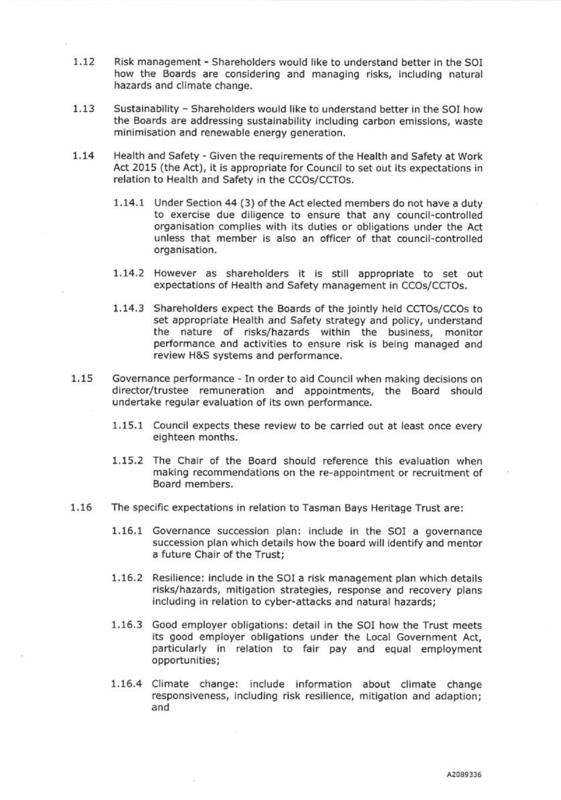 4.1 Under the Local Government Act, TBHT is required to deliver a draft Statement of Intent (SOI) to the councils on an annual basis no later than 1 March each year. 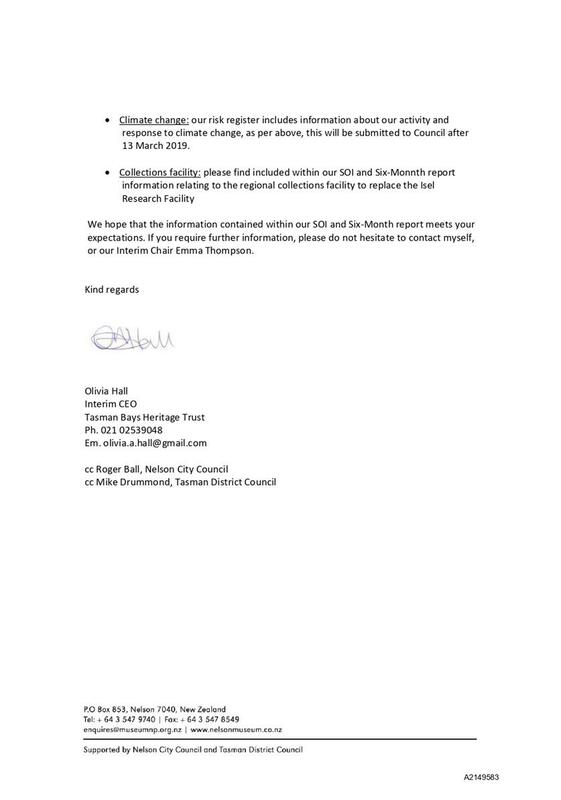 4.2 The councils have an opportunity to provide feedback to the Board of TBHT within two months of this date and the Trust then has until 30 June 2019 to deliver the final SOI to the shareholders. 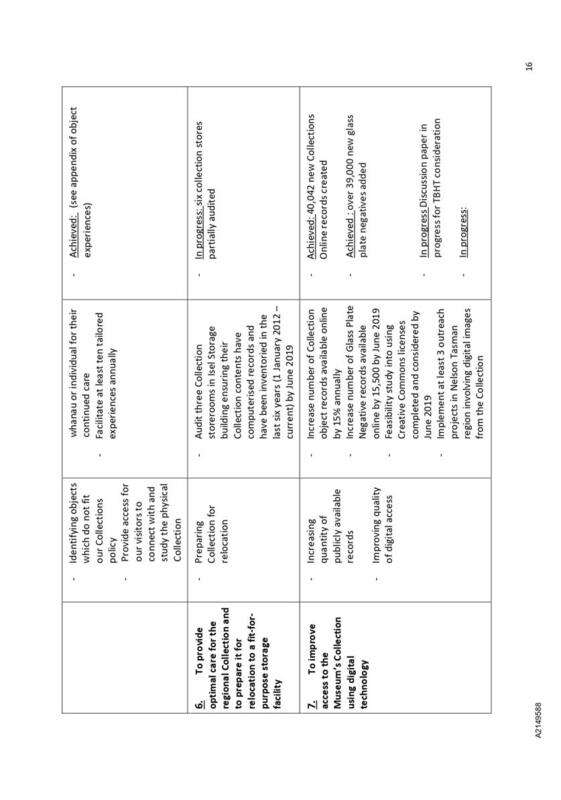 Confirms the general expectations including renewable energy generation in clause 6.13 for Statements of Intent/Statements of Corporate Intent set out in paragraphs 6.1 to 6.15 in report R9762. 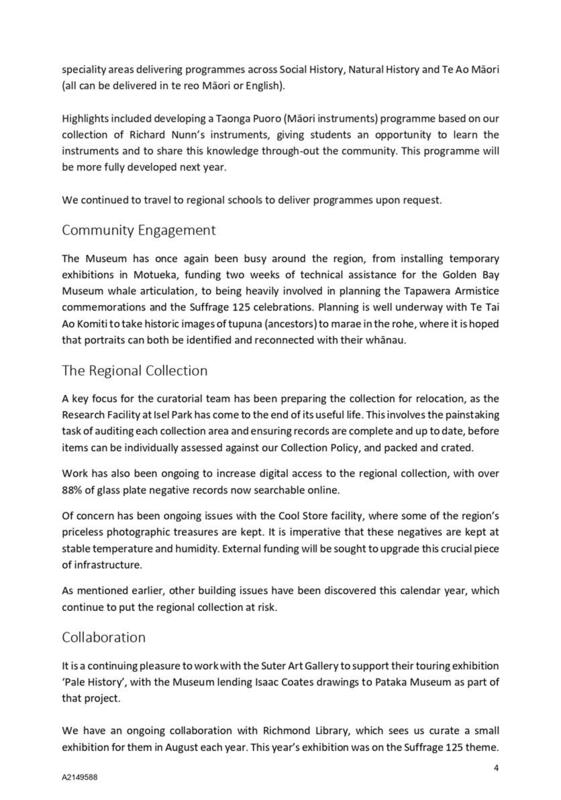 4.4.5 Collections facility: detail plans to progress work to develop a regional collections facility to replace the Isel Park building. 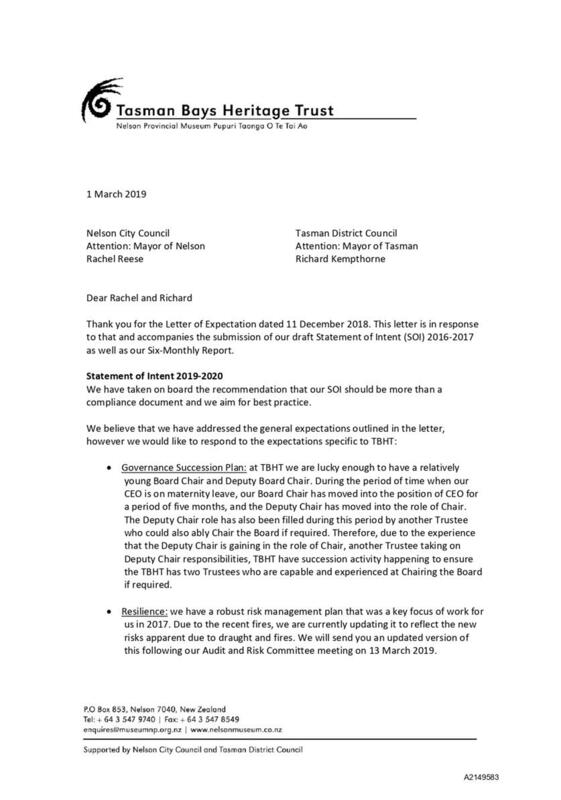 4.5 The letter of expectation (Attachment 3) was sent to TBHT in December 2018 outlining the general expectations and specific matters that the councils would like to see addressed in the SOI for the 2019/20 year. 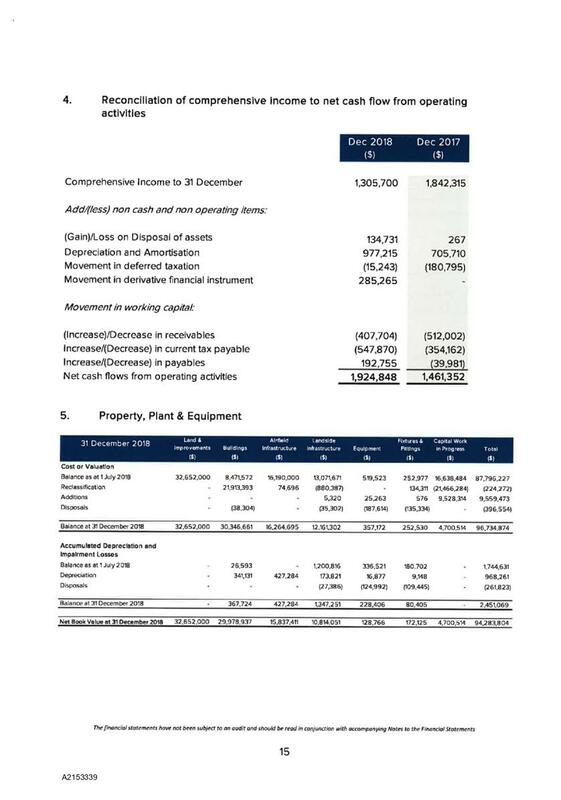 4.6 TBHT provided a half yearly report to December 2018 (Attachment 1) and a draft Statement of Intent (Attachment 2) dated 1 March 2019, and received by email on 4 March 2019. 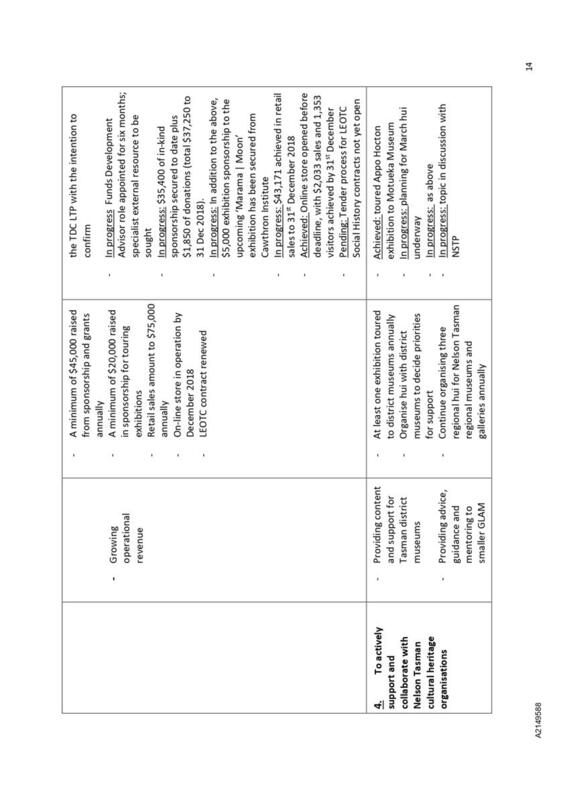 Aside from this small delay, this documentation meets the requirements of the Local Government Act. 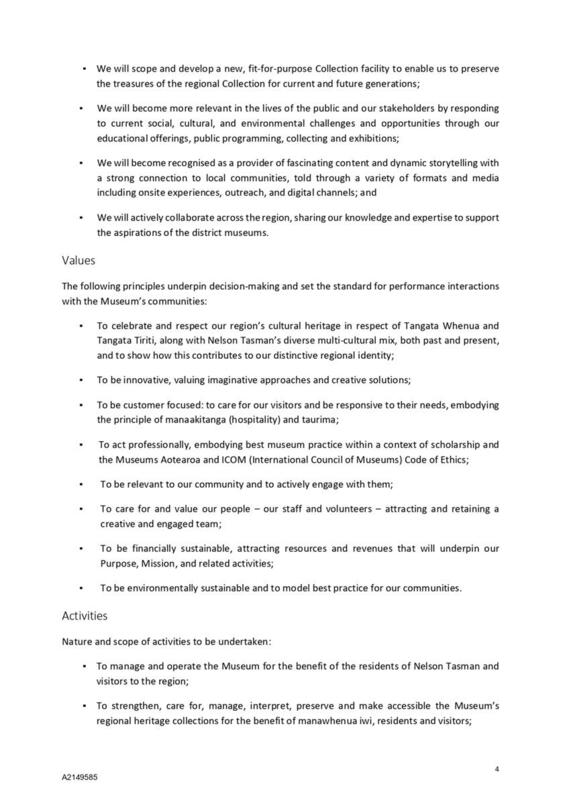 The Trust also sent a cover letter (Attachment 4) responding to the matters contained in the letter of expectation. 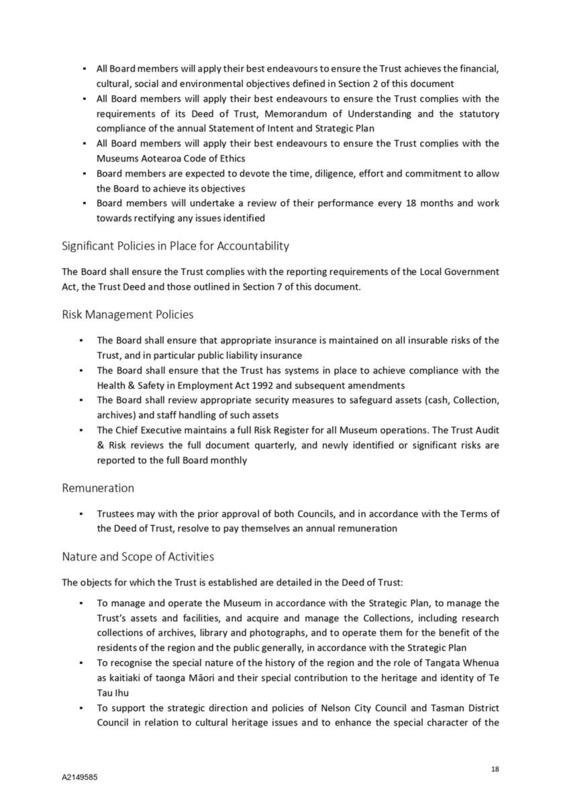 The cover letter notes the TBHT is required to have a robust risk management plan; that the Board is updating this plan in light of recent emergency events; and the Board will provide a copy to the Councils. 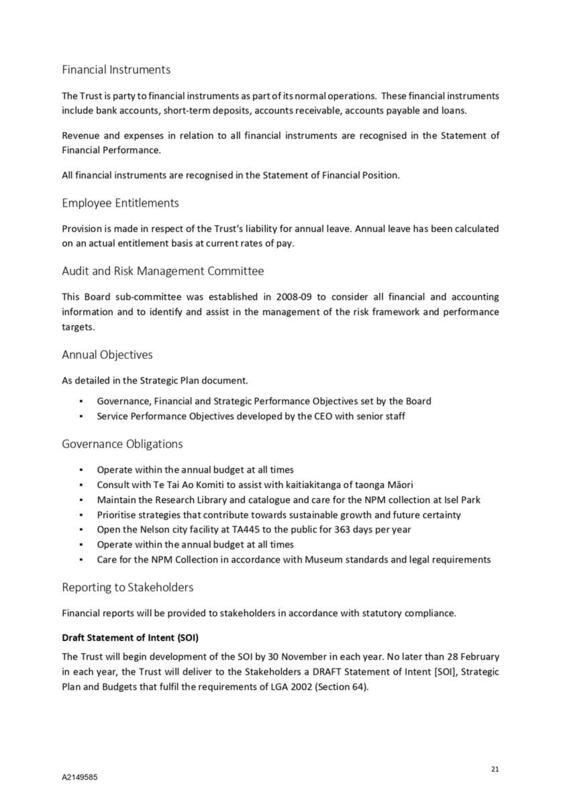 Subject to receipt of the updated risk management plan, the TBHT has responded satisfactorily to the matters contained in the letter of expectation. 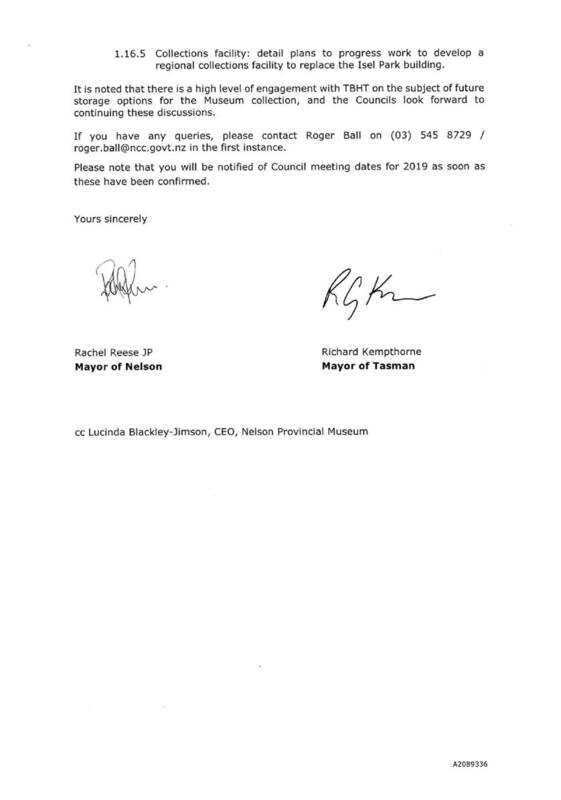 4.7 The Interim Chair of the Board, Emma Thompson, and Interim CEO, Olivia Hall, will be in attendance at the meeting to present information and to answer questions. 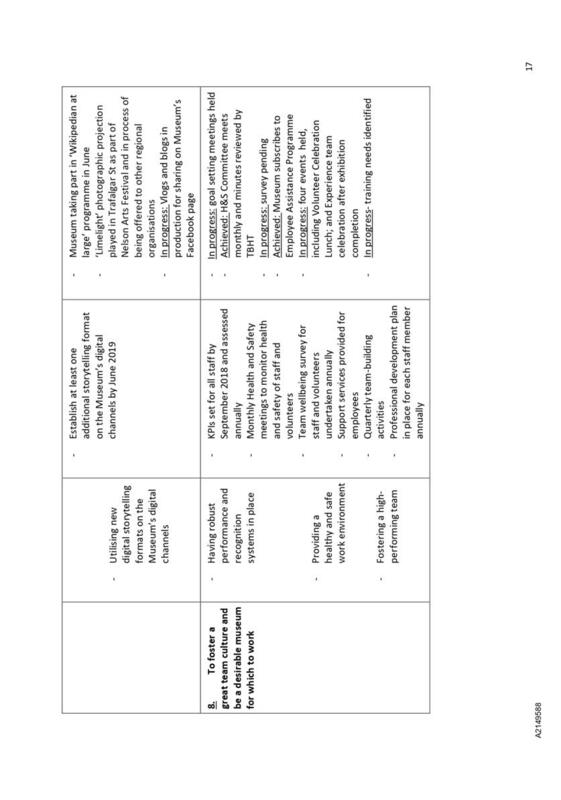 5.1 The cover letter (Attachment 4) deals with specific requirements in relation to the letter of expectation. 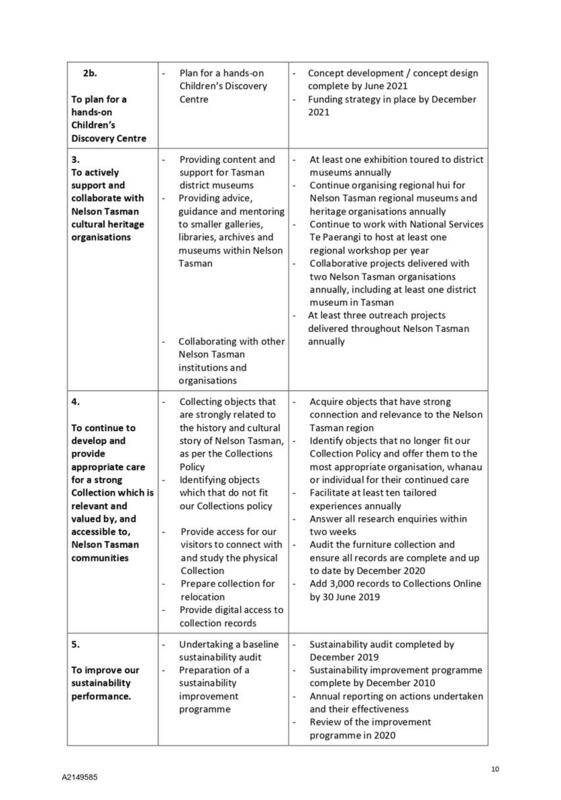 5.2 TBHT has clearly been developing its strategic plan and the SOI sets out the priority work streams for forthcoming years. 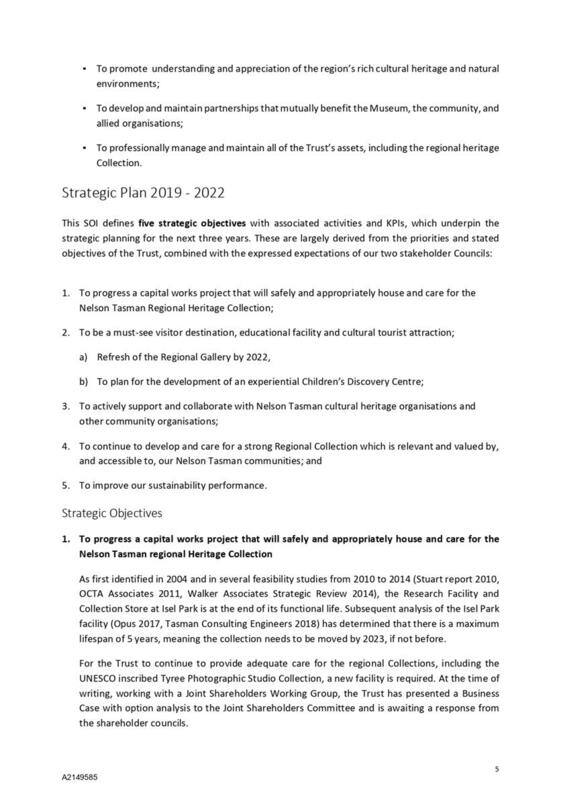 5.3 Strategic Objective One in the draft SOI (p. 5 of the SOI) describes a project to safely and appropriately house and care for the Nelson Tasman Regional Heritage Collection. 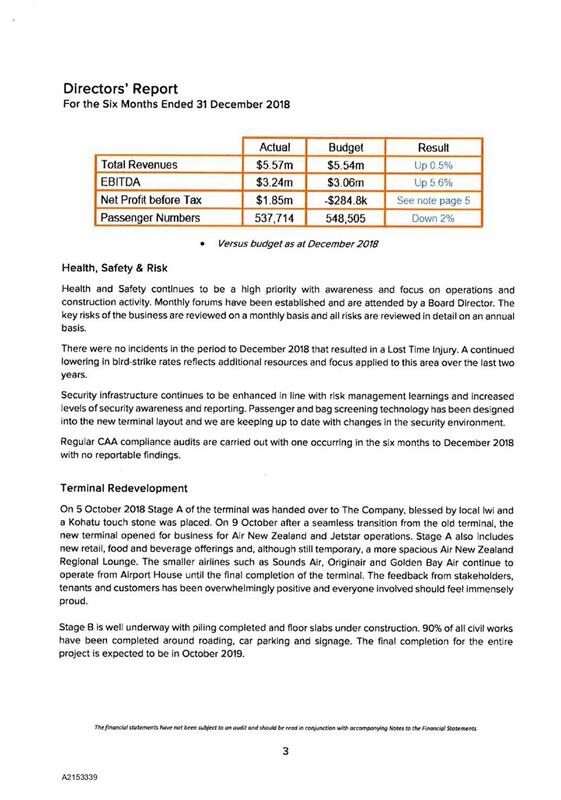 The TBHT has previously presented a business case with a preferred location. 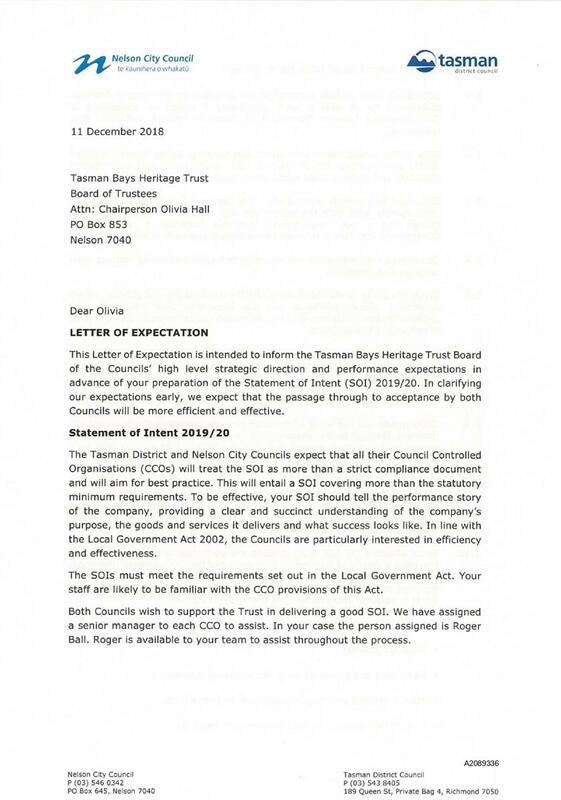 In response to this, officers from the two councils met with TBHT and requested a peer review, at the councils’ expense, of the costings in the business case. 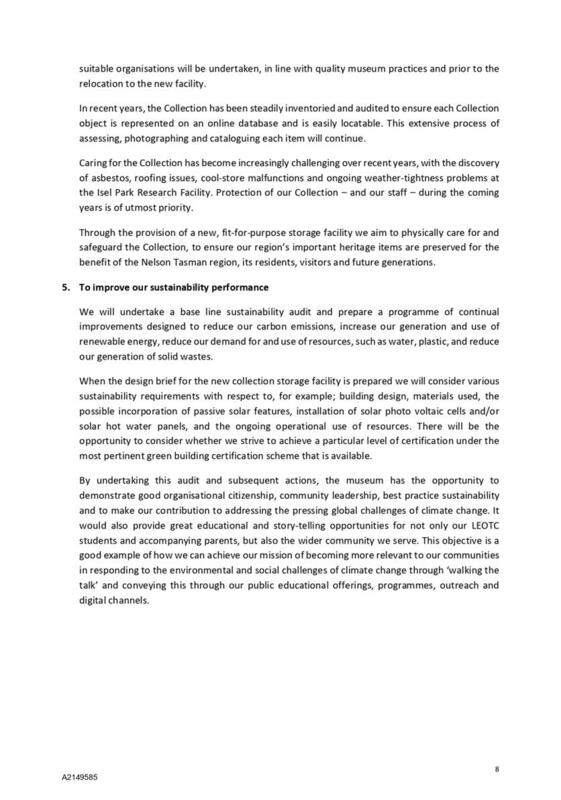 The aim of this is to help ensure the cost estimates for the new facility are robust. 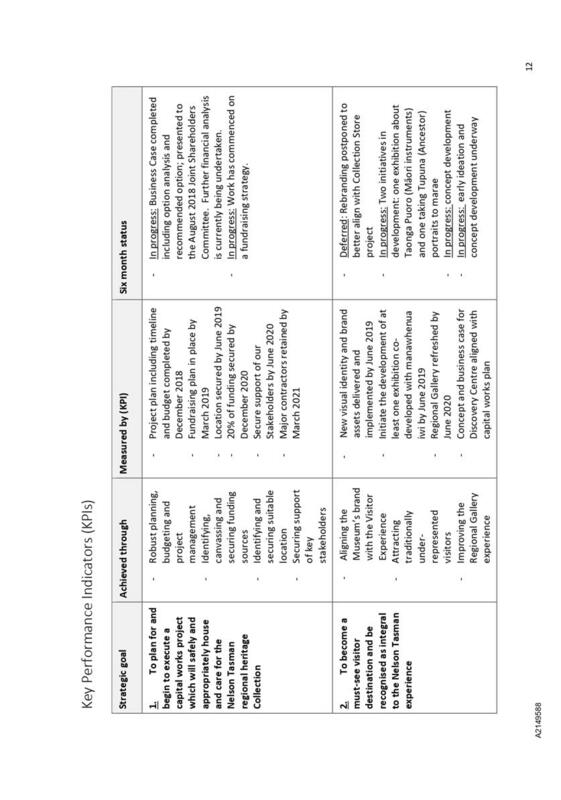 The outcomes from this peer review were presented by TBHT to the Joint Committee at its meeting on 26 March 2019. Discussions have also been held regarding the implications of asbestos assessments at the Isel facility. 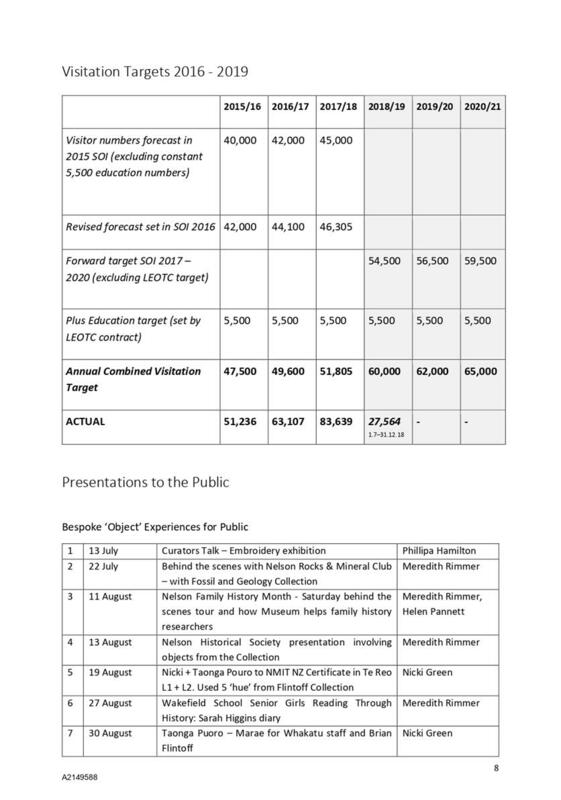 5.4 The visitation targets described on p. 11 of the SOI record very positive trends with visitor numbers, with actual visits now exceeding forecasts out to 2021/22. It would seem appropriate to recast the forecast figures in light of the trend. 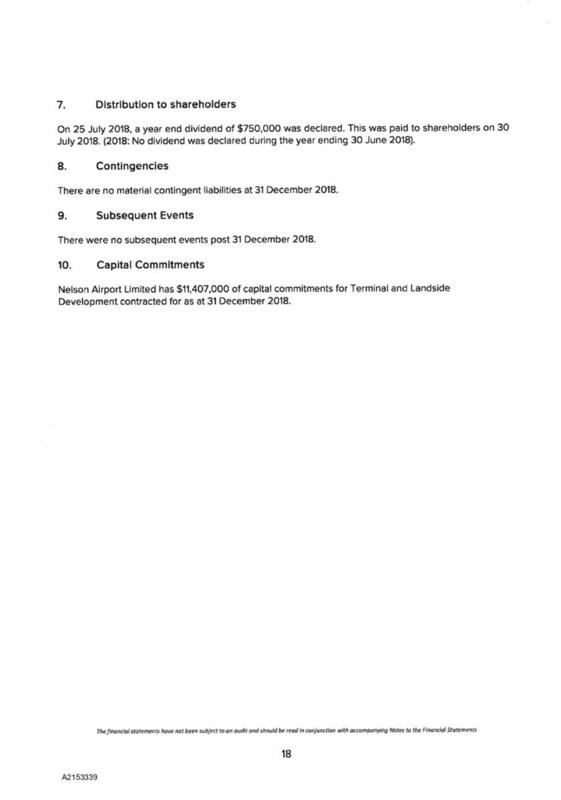 5.5 The TBHT has a loan with each council amounting to $825,000 per council as at 31 December 2018. 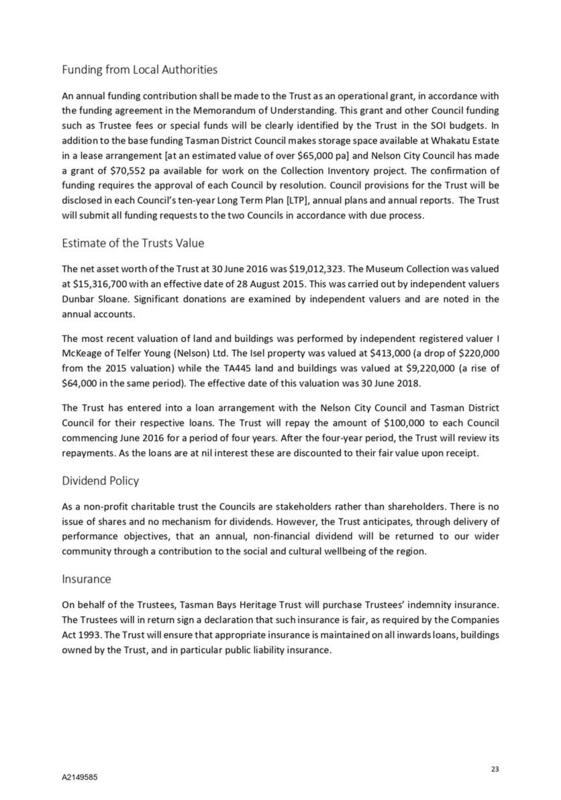 The SOI states (p. 23) that the Trust will repay the amount of $100,000 to each council for a period of four years commencing June 2016. 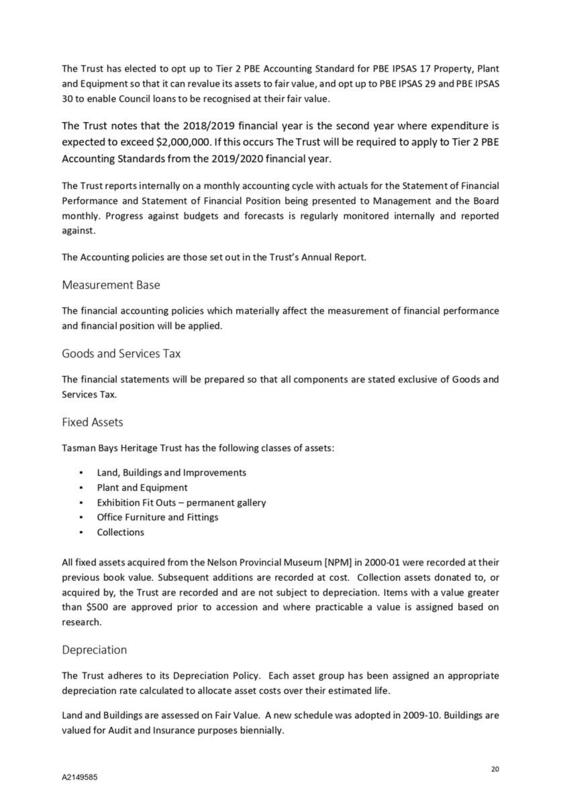 The TBHT says it will review its repayments after this. 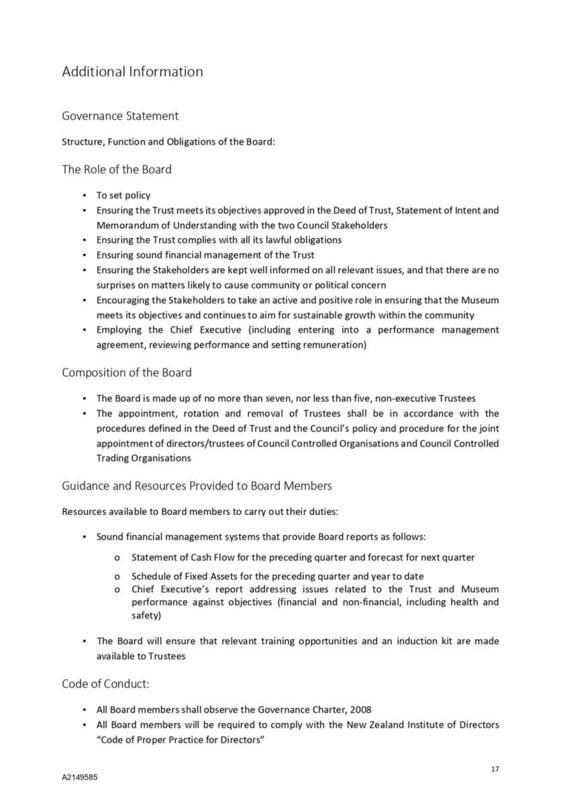 The Interim CEO, Olivia Hall, has advised officers that the TBHT is “committed to repaying $100,000 per council in the 2018/2019 year and [has] budgeted for it again in the 2019/2020 year. 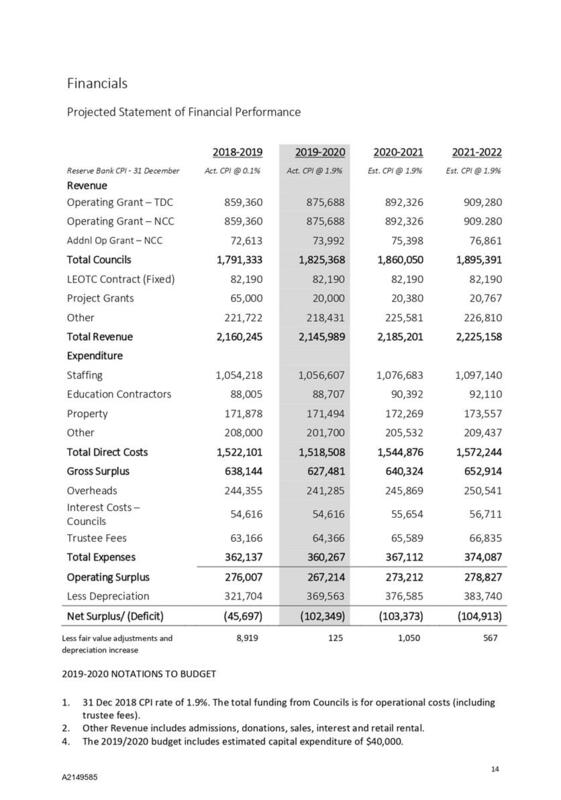 At this stage the TBHT [has] not made a commitment to continue at this level beyond the 2019/2020 year and [has] budgeted it back at the substantive amount of $50,000 per council per year. 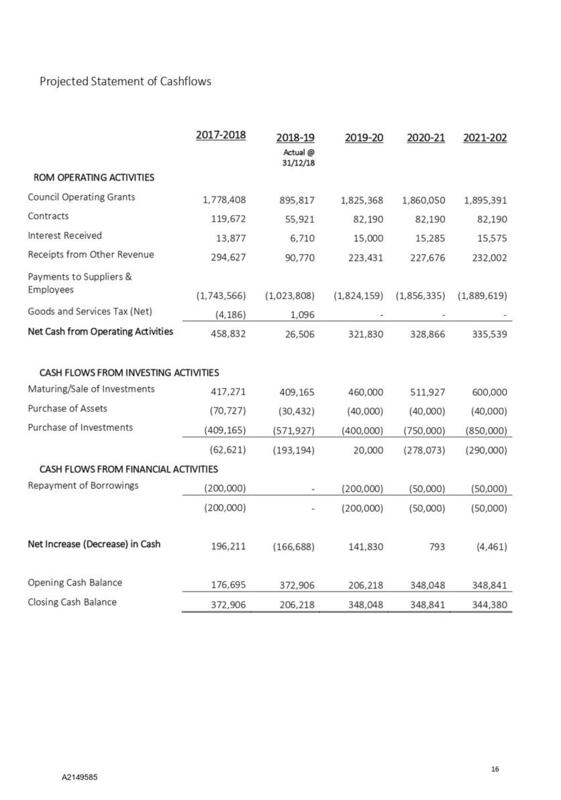 This has been reflected in the SOI budget financials”. 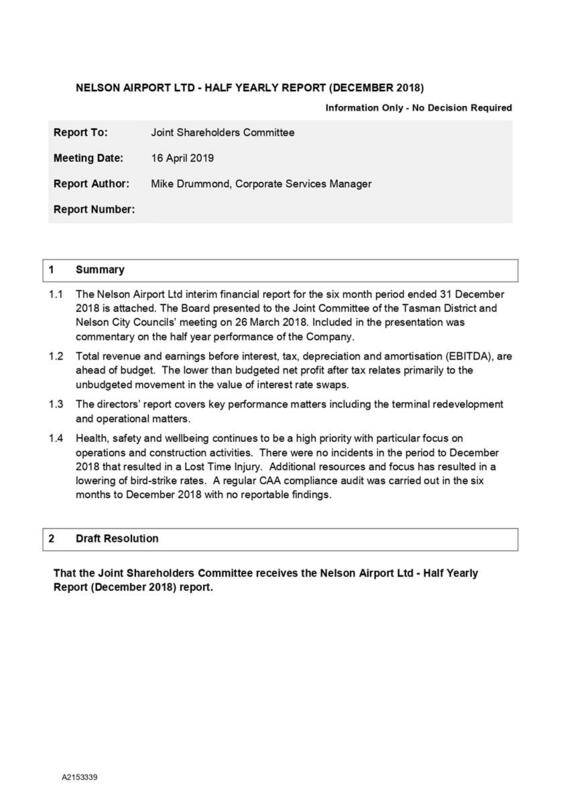 5.6 TBHT presented information from its half yearly report to the Joint Committee on 26 March 2019. 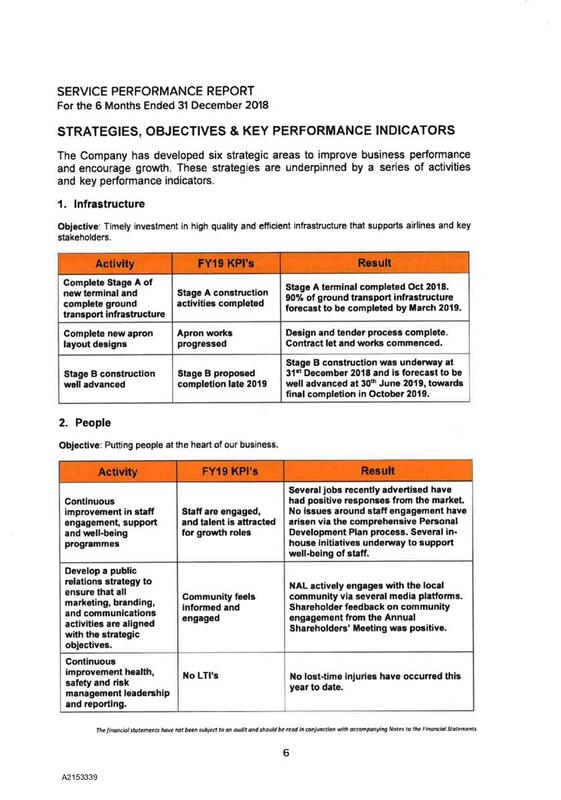 5.7 The half yearly report shows that TBHT is on track to meet the majority of its objectives for the year. 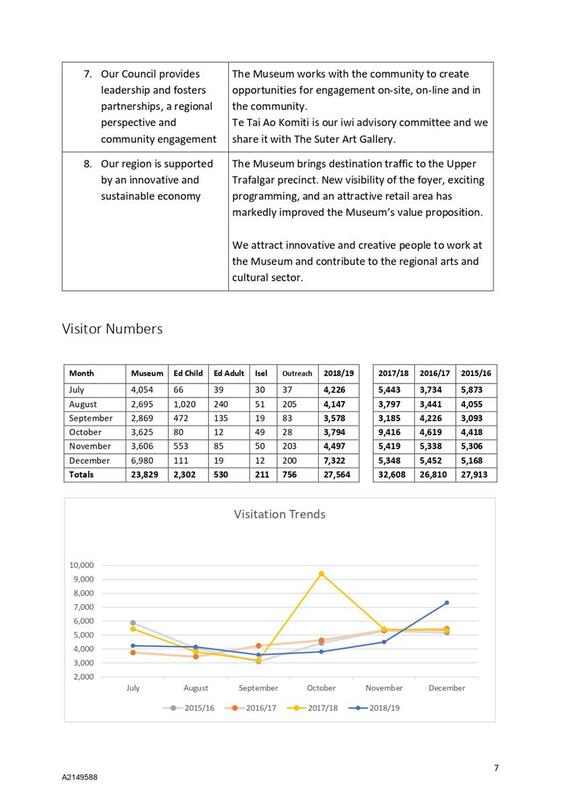 Visitor numbers are well up on the comparable period for 2017, at 32,691, and are tracking ahead of the target of 51,805 for the year. 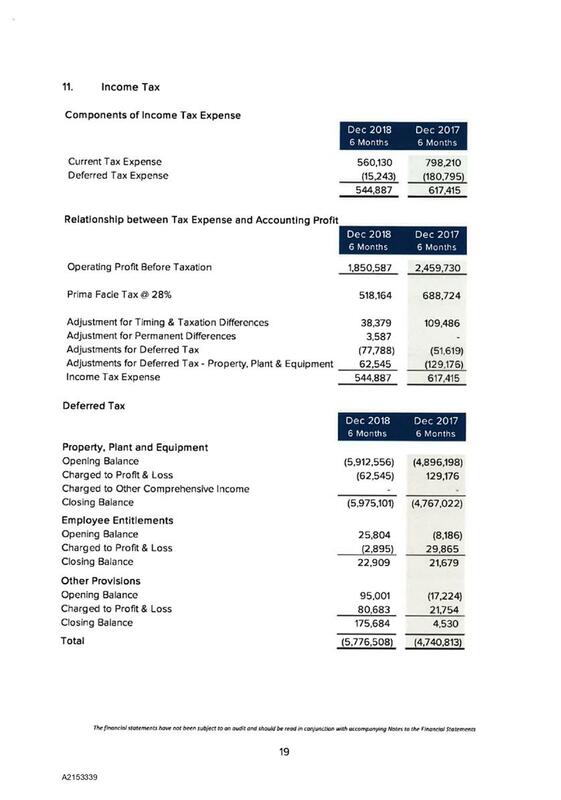 5.8 Revenue is slightly ahead of budget as are direct and other expense costs, meaning the operating profit (before depreciation) is close to budget. 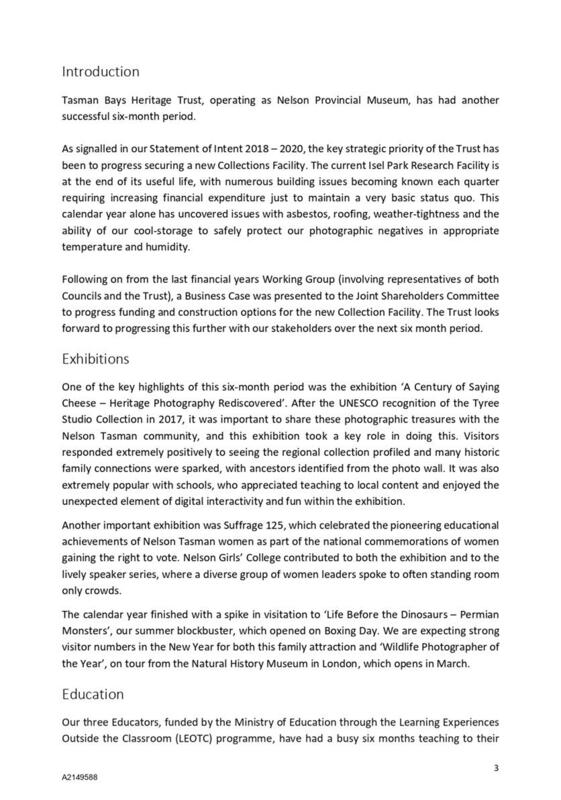 In response to a question from officers, TBHT explained that increased visitor numbers will not result in additional revenue in the current financial year as there is no paid exhibition planned for 2019/20 (unlike in 2018/19). 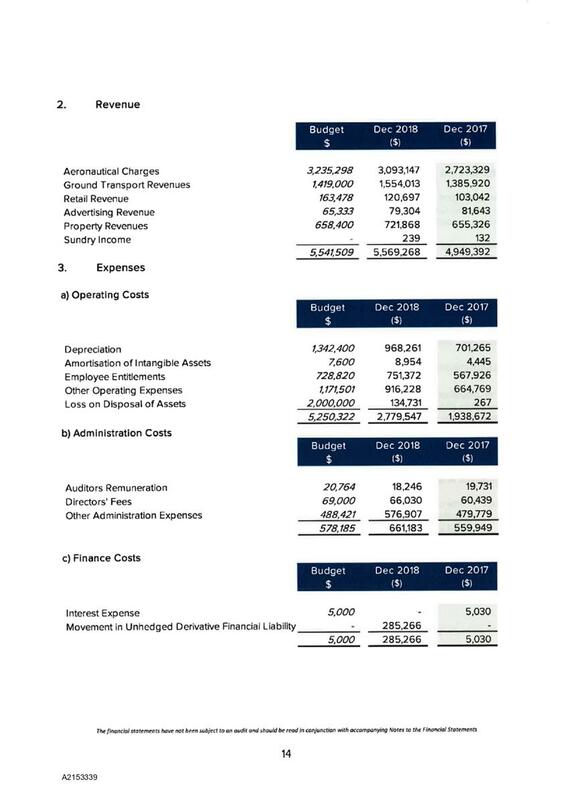 5.9 The Board had budgeted to run a deficit after depreciation of $80,184 year to date and is currently tracking at $99,844 due to higher depreciation. 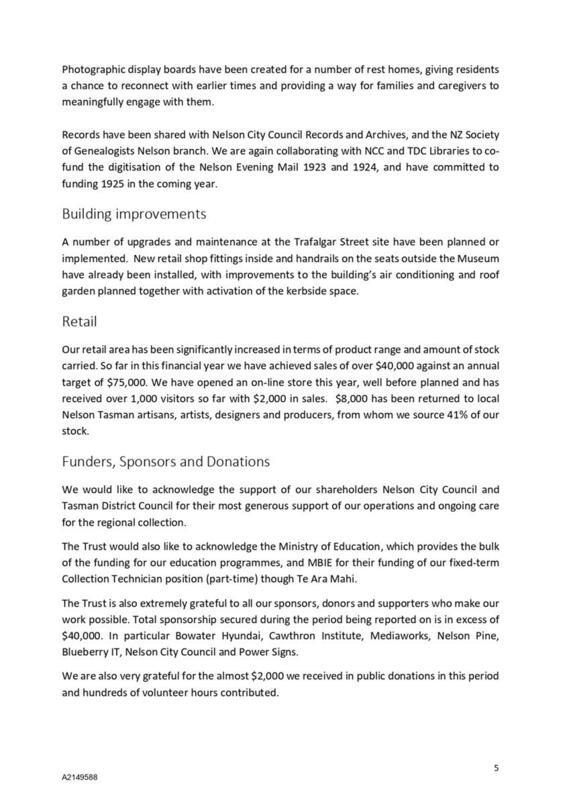 As in previous years, the TBHT does not plan to fully fund for depreciation (as the Councils do not fund TBHT for this). 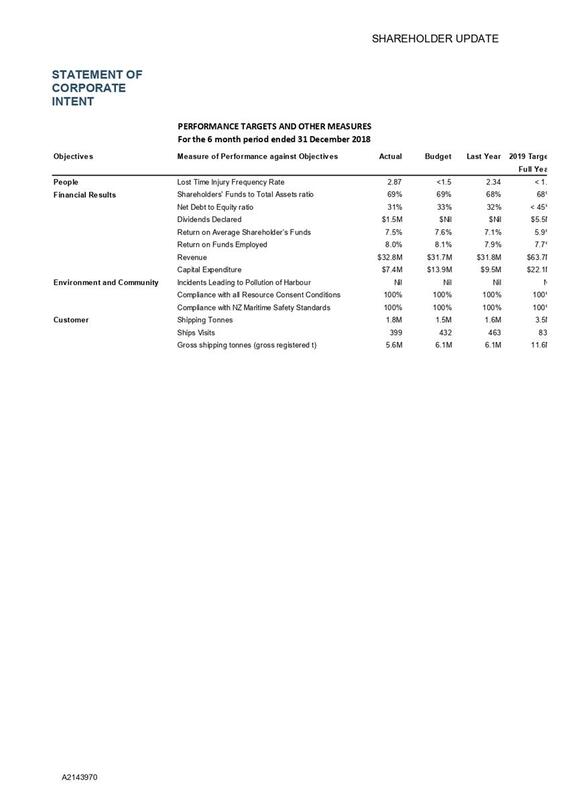 CPI has been estimated at 1.9% and there may some risks with wage inflation being higher. 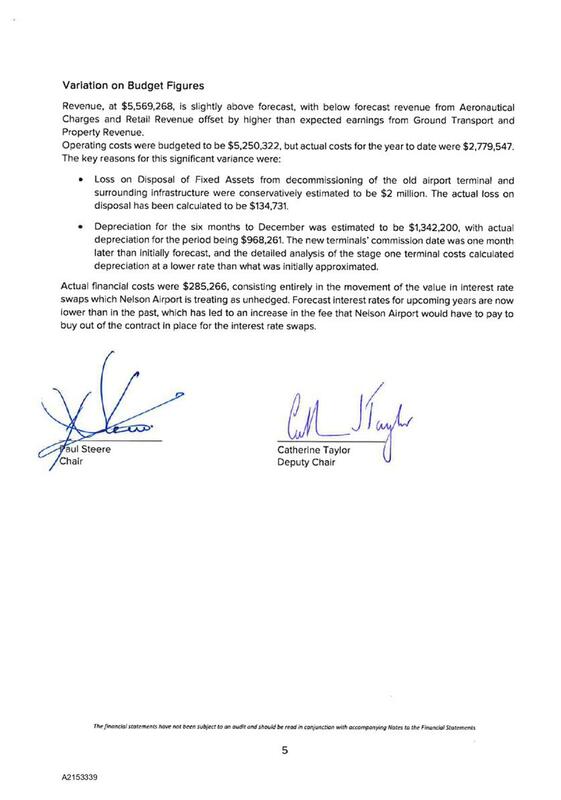 The Board continues to build up cash, with $778,000 in the bank. 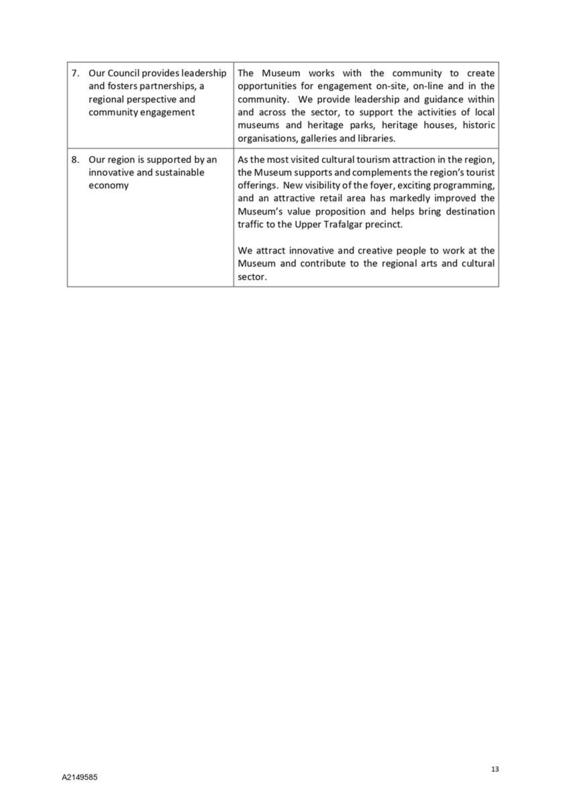 5.10 The Trust has engaged in a number of outreach activities across the region and continues to work closely with the region’s smaller museums on exhibitions and training. 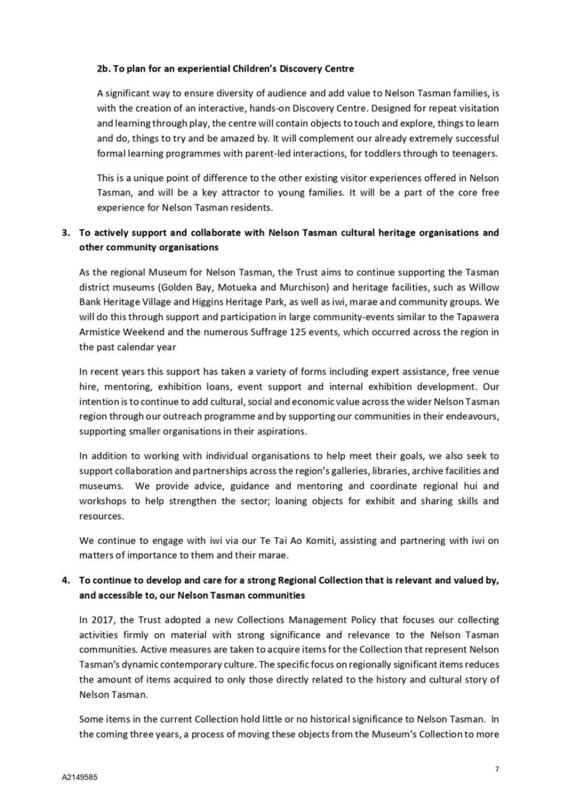 5.11 It is pleasing to note that income from the museum shop is starting to make a more significant contribution to revenue. 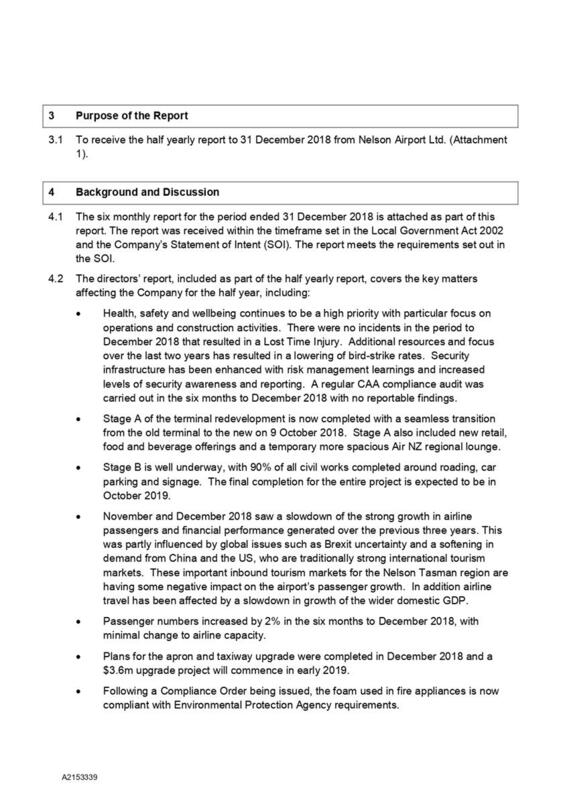 6.1 There is no decision to be made on the half yearly report. 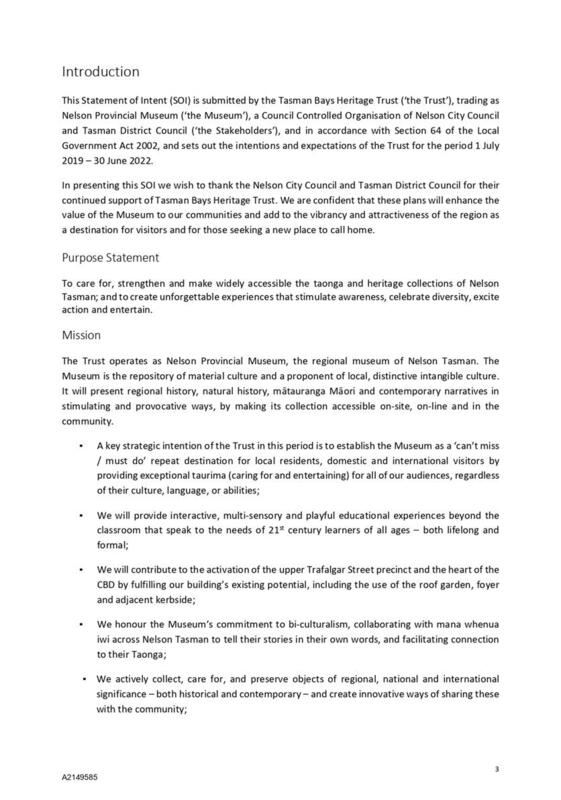 TBHT has complied with the legislation in preparing and presenting the report to the councils. 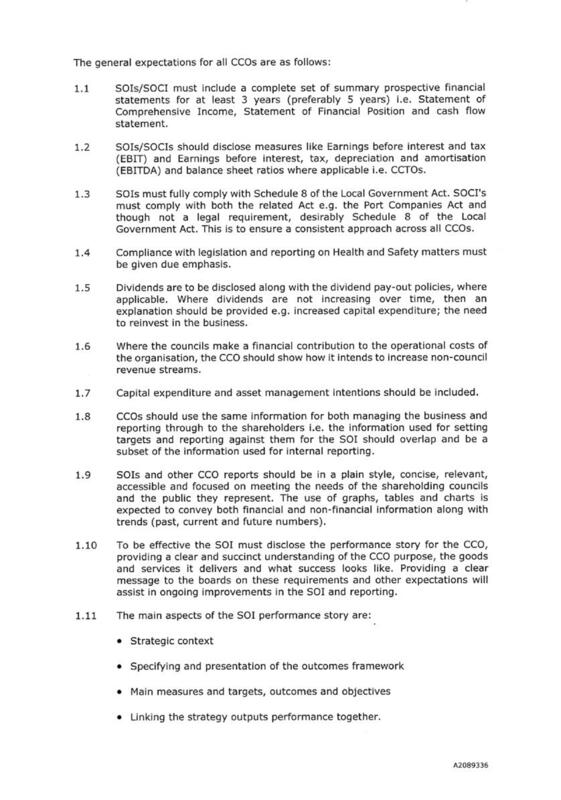 6.2 In relation to the draft SOI, the Committee can choose to either provide feedback to the Board of TBHT or accept the SOI as the final version (with any minor amendments). If the Committee does submit substantive feedback, then the amended SOI will be brought back to the Committee in August. 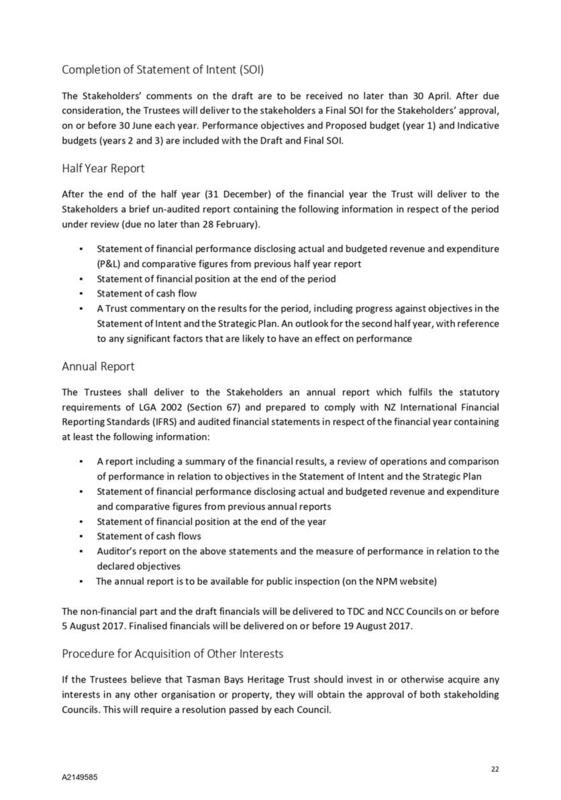 7.1 TBHT has not met its statutory timeframes for submission of its half yearly report and draft Statement of Intent, however this appeared to be a technical hitch and is not considered material. 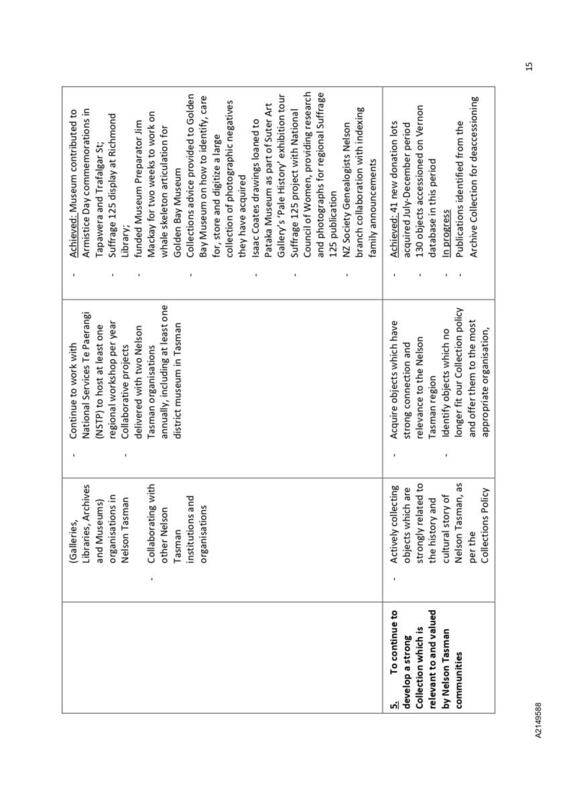 The Committee has the ability to accept the draft SOI as it is or to provide feedback to TBHT for inclusion in its final SOI, due by 30 June 2019. 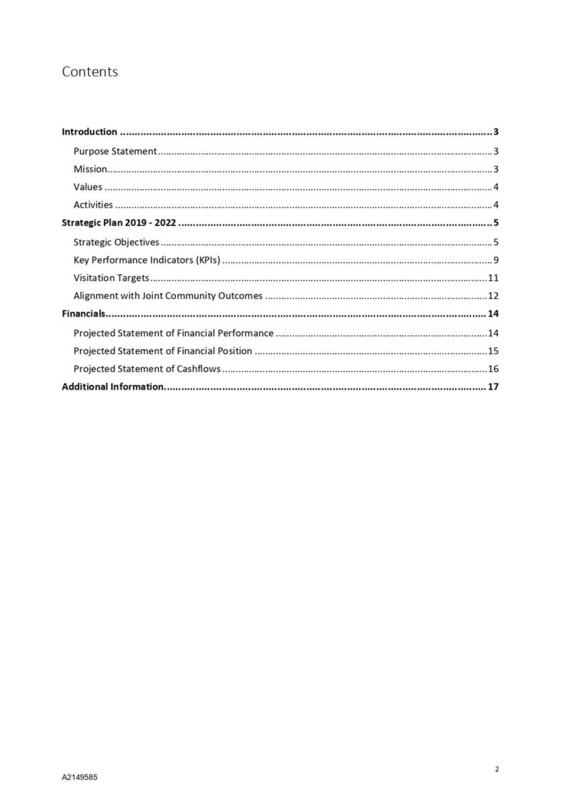 The preparation of a draft Statement of Intent and delivery of the half yearly report is a requirement of Schedule 8 of the Local Government Act. 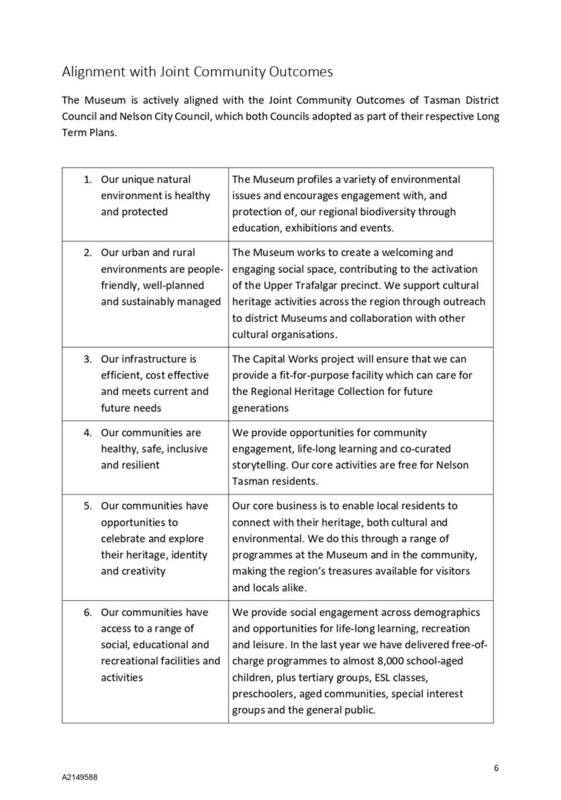 The museum contributes to the outcome ‘Our communities have opportunities to celebrate and explore their heritage, identity and creativity’ and ‘Our communities have access to a range of social, educational and recreational facilities and activities’. 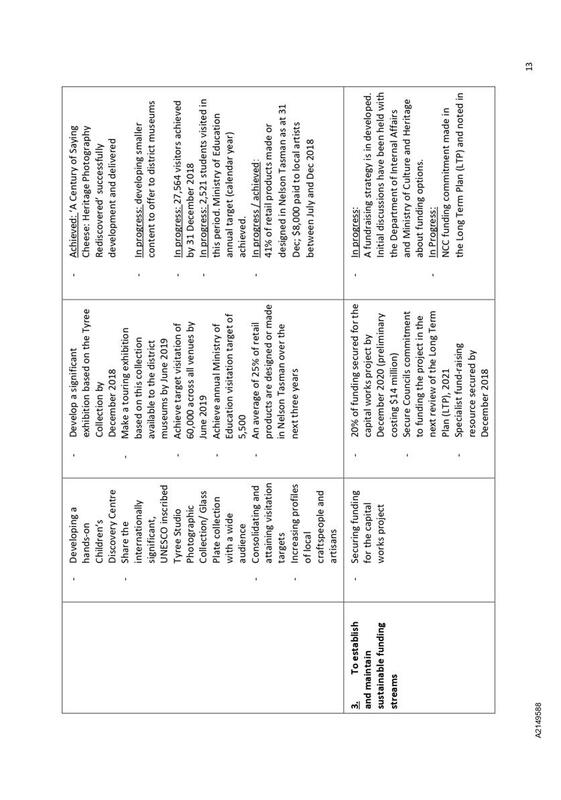 There is a low risk that the Statement of Intent does not deliver the outcomes expected by the councils. 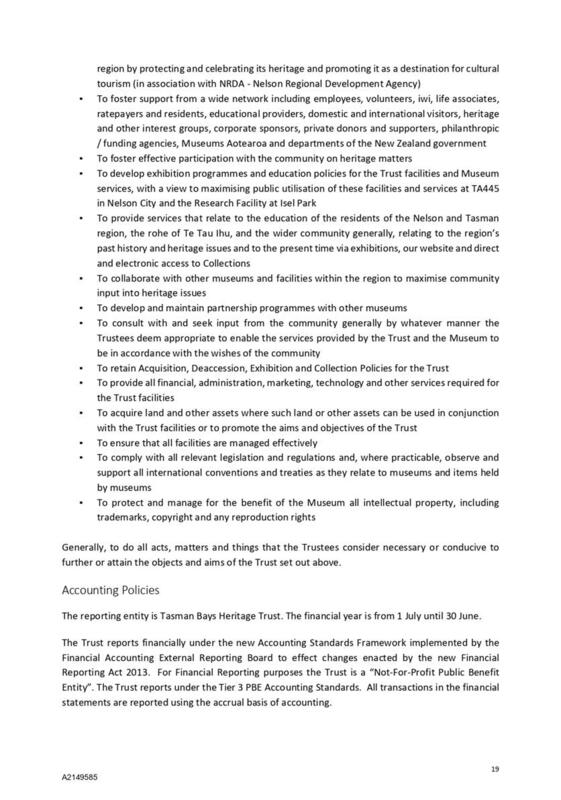 There is medium risk that expectations of funding for a project to house and care for the Nelson Tasman regional heritage collection may not be realised. 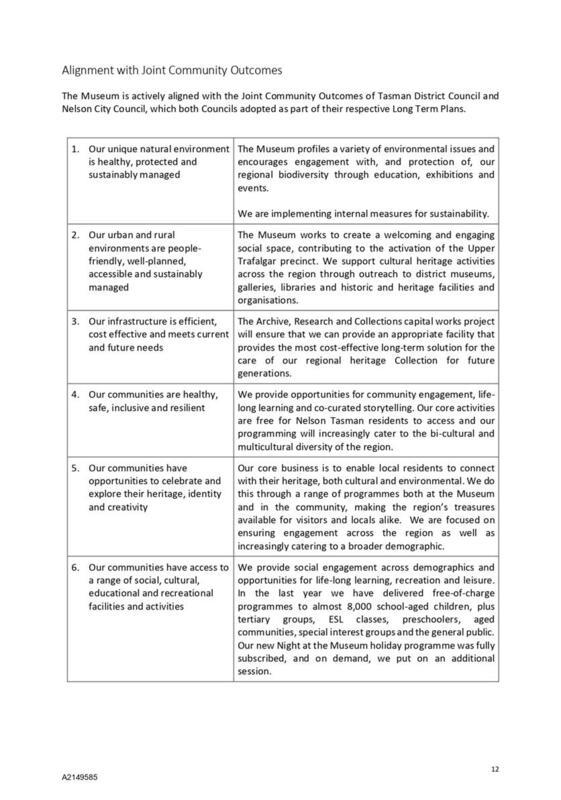 The provision of the museum is a budgeted activity for both councils. 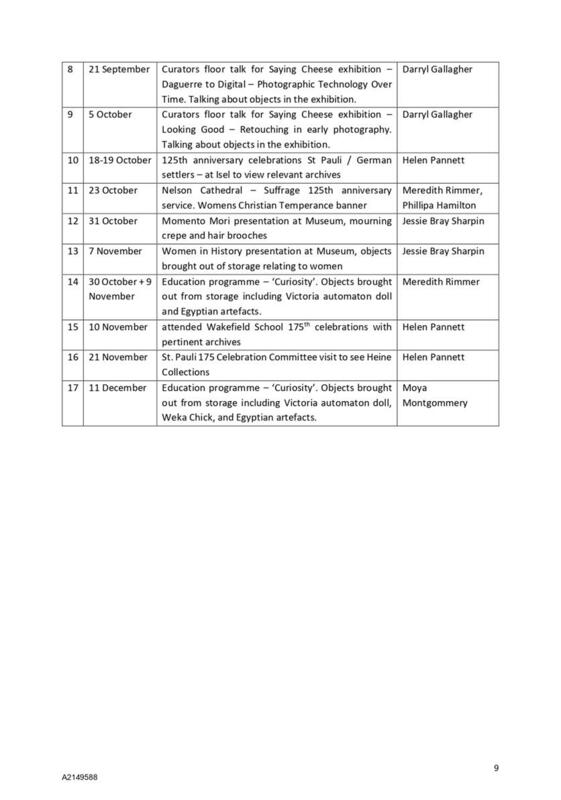 No engagement with Māori has been undertaken in preparing this report. 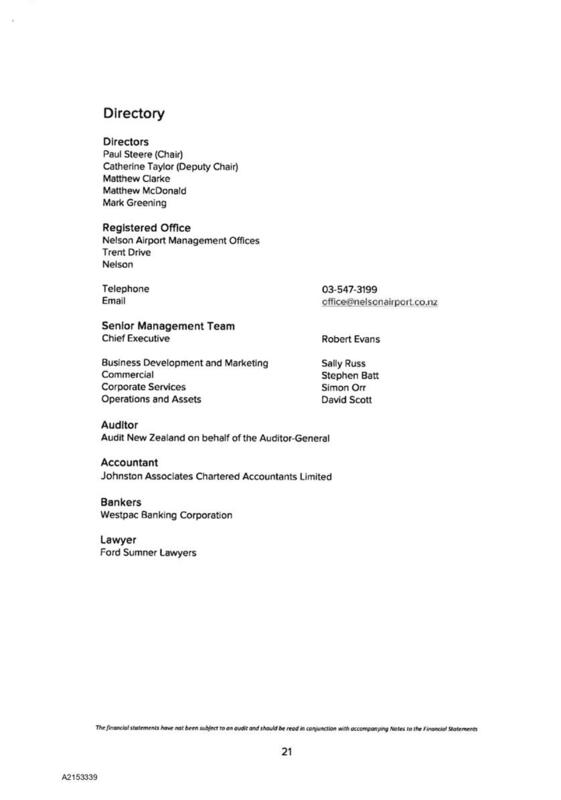 Iwi are represented on the Trust Board. 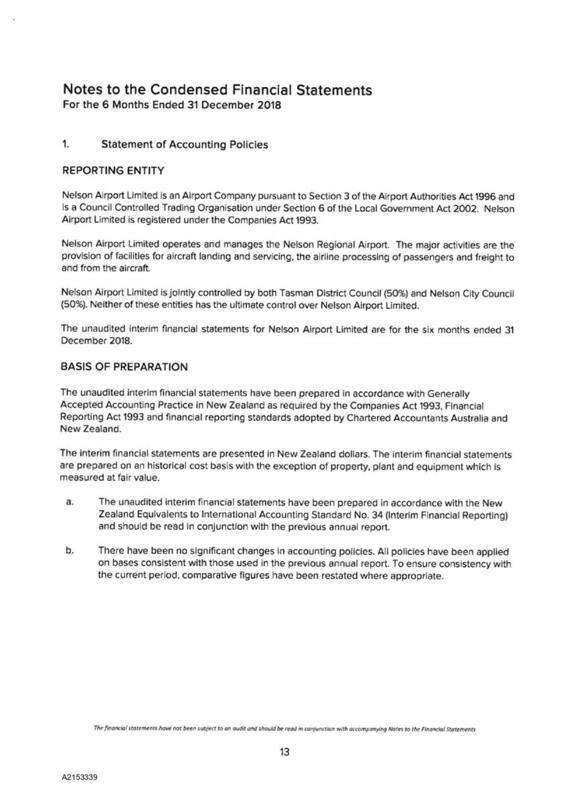 All matters relating to jointly owned Council Controlled Organisations and Council Controlled Trading Organisations, including statements of intent, statements of corporate intent, half yearly reports, the appointment of directors and setting of directors’ fees. 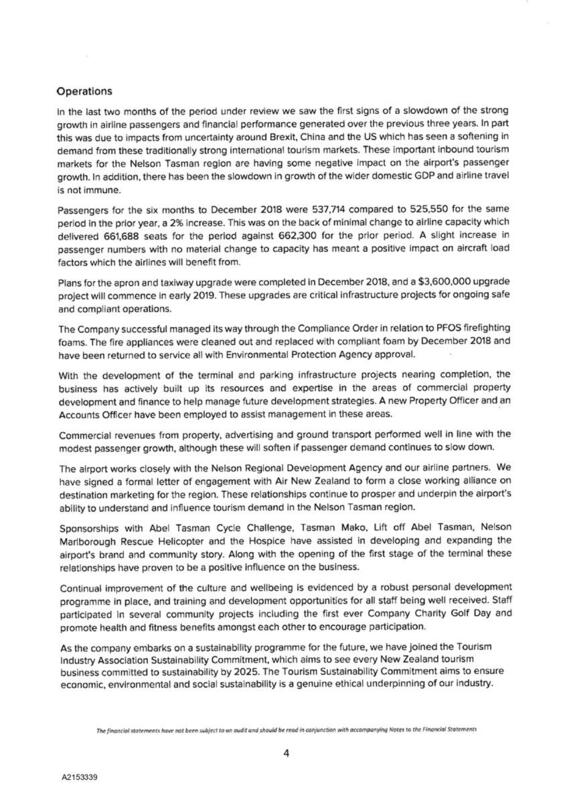 Receives the report Nelson Airport Limited half yearly report to 31 December 2018 (R9954) and its attachment (A2153339).